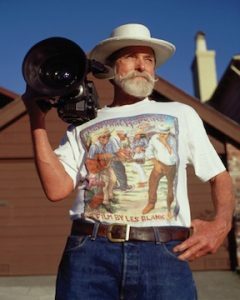 Les Blank is considered one of the pre-eminent documentary filmmakers of the past 50 years. According to the New York Times, “Blank is a documentarian of folk cultures who transforms anthropology into art.” His films have been a series of intimate glimpses into the lives of passionate people who live at the periphery of American society, including such titles as Garlic Is As Good As Ten Mothers, Spend It All, A Well Spent Life, Gap-Toothed Women, Burden of Dreams, The Blues Accordin’ To Lightnin’ Hopkins, Always For Pleasure, In Heaven there Is No Beer?, All In This Tea, Chulas Fronteras, and Sprout Wings And Fly. His more recent films have taken him to China and other parts of the world. He has received the British Academy Award for Best Feature Documentary, Special Jury Award at the Sundance Festival, and the American Film Institute’s award for outstanding lifetime achievement as an independent filmmaker. His work has been supported by the National Endowment of the Arts, the National Endowment For the Humanities, The Ford Foundation, and The Guggenheim Foundation, among others. Two of his films were selected by the U.S. Library of Congress for inclusion in the National Film Registry. In November 2011, Les was presented the Career Achievement Award by the International Documentary Association.